PORTLAND – More field goal attempts, more points in the paint, more fast break points and transition opportunities, more bench points and more points off turnovers. The formula was there for the Thunder in Game 1 against the Portland Trail Blazers. The shot-making wasn’t. If Head Coach Billy Donovan’s club can maintain it’s identity from Sunday and get a few more shots to drop on Tuesday, the Thunder could be heading back to Oklahoma City with a 1-1 split in this opening round playoff series. Despite winning all the battles on the margins that it must in order to win games and holding Portland to just 41.9 percent shooting, the Thunder itself shot just 39.8 percent from the field including 5-of-33 from three and 4-of-12 in transition in the Sunday loss. In a way, the numbers paint a rosy picture for Game 2 in the Rose City. Even if shots do drop more in Game 2, there are some areas for the Thunder to scrub clean. The Thunder will focus on every possession while playing faster on offense and defense. Allowing 13 offensive rebounds and 14 second-chance points was far too many, with a bunch coming on rotational box outs where Thunder guards had to battle with the likes of Enes Kanter on the backside of the lane. Staying in front of the ball on the perimeter and busting around screens can allow Thunder bigs like Steven Adams to recover back to the middle. “Gotta be physical. They’re good, top two or three in the league offensive rebounding. You gotta do a good job of putting a body and getting to the ball,” said Russell Westbrook. The Thunder also committed five offensive fouls and had nine shots blocked in the game. If even a quarter of those possessions had ended up in a field goal instead, the game might have had a different result. Playing with proper spacing, avoiding plays in crowds and making wise decisions in the open floor and once in the lane can make a huge difference in Game 2. Most importantly for the Thunder, beyond some of the x’s and o’s of the game, is the intensity, focus, stamina and toughness that it brings for all 48 minutes, starting right away from the opening tip. In the playoffs, every possession counts and none can be dismissed when it comes down to the final outcome. Starting the game better than the Thunder did in Game 1 when it fell behind by 19 will be imperative when trying to steal back home court advantage with a tough road win. “We got the game plan. We’re going to go out and deliver it in Game 2,” George said. -	From a strategy standpoint, the Thunder would prefer this game be played to different speed than it was on Sunday, when the action slowed in the second half. While it’s not only on the fast break that the Thunder wants to push tempo, the team does fare better if it can play in the open floor, get defenders moving and generate space within the halfcourt in order to carve out driving lanes to the paint, particularly if Blazers big men are going to be hanging back at the rim. -	In order to maintain that identity for the full 48 minutes, the Thunder has to be willing and able to concentrate possession after possession and deliberately create specific situations that it wants on each trip down court. Defensively that means getting back in front of the ball as quickly as possible for the guards. Offensively it means running actions that will take advantage of the Thunder’s strengths every single time. 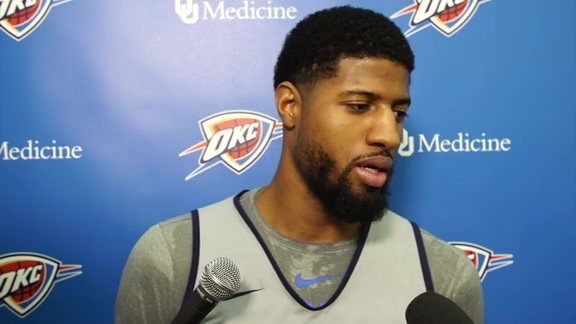 - After missing the Thunder season finale in Milwaukee and being listed as questionable for Game 1 against the Blazers, George reported at practice on Monday that he is “pain free” in his right shoulder. He didn’t do anything on the court between last Tuesday night and Sunday morning while he recovered, so George was happy to have a full day of practice and a chance to catch a rhythm at the Moda Center on Monday before Tuesday’s shootaround and Game 2. - George’s perimeter partner Terrance Ferguson nearly tripled his previous playoff experience in one game by playing 16 minutes against the Blazers on Sunday after only playing six total postseason minutes last year in his rookie campaign. 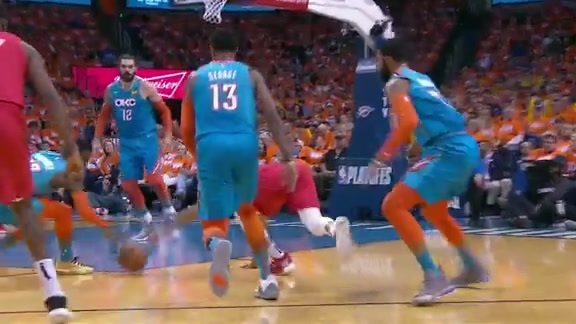 Ferguson picked up some quick fouls while chasing around CJ McCollum, but was encouraged by a veteran defensive stopper on the Thunder bench – Andre Roberson – to stay with it as the series goes on. Chris Fisher and Michael Cage discuss the Thunder converting on turnovers and slowing down the Portland guards.